It’s for a select group of people. It may not be for you. I saw ads for his altMBA course and The Marketing Seminar in the past couple years. I was never interested. After all, it said “it’s not for everyone.” There was no affiliation to a university or college, there was no credit toward a degree, there are no exams and they don’t even have a football team. It has to be a waste of time and money. 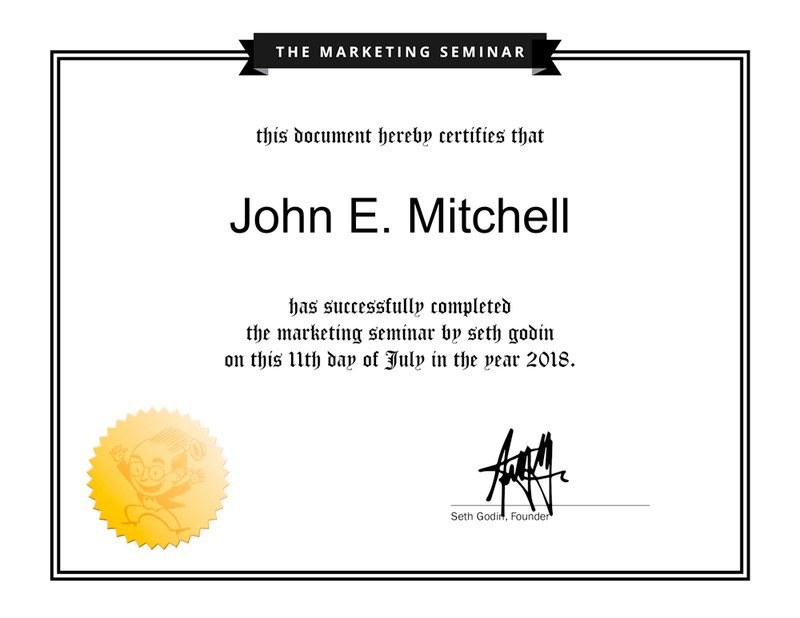 The Marketing Seminar came across my social media browsing again in April. This time with a “free – check it out bate.” I bit. Sixty – lessons, each with a video from Seth, students from all walks of life and from all corners of the planet and everyone encouraged to post their response to the lessons on line and to comment on the responses of other students. Feedback from other students who maybe from a totally different walk of life as well as very leading questions from the coaching team stretched my mind and my imagination. It’s not what I consider traditional education. It’s outside the box. Way outside the box. If you’re looking for an accredited course you can add to your resume, it’s probably not for you. If you’re looking for a challenge and an opportunity to stretch your beliefs and your thinking this tribes for you. So did anything change as a result of this? To find out how I do that go here. I wonder if the reason the seal on the certificate of completion has a picture of the little man from Monopoly on it is because I’ve passed GO? This entry was posted in What I Do and tagged John Mitchell Photography.